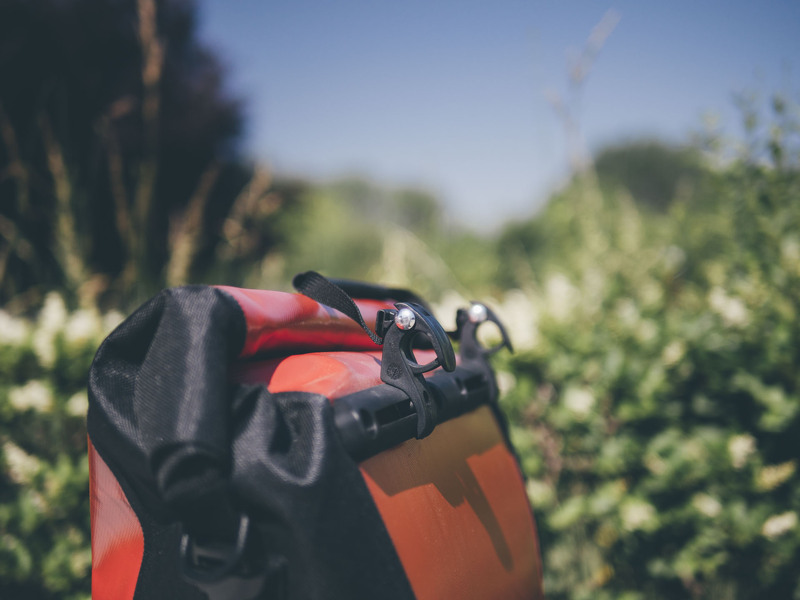 Although significantly cheaper than some other bags, the Ortlieb Back Roller City Panniers retain most of the major features that are synonymous with the German brand, including their signature waterproof construction. No matter how you look at them, these are incredible performers that punch well above their weight. “The steel horse fills a gap in modern life, it is an answer not only to its needs, but also to its aspirations… It’s quite certainly here to stay.” — The world’s first cycling magazine, Le Vélocipède Illustré, in 1869. Human-powered movement has been a subject of scientific exploration for centuries, and the humble bicycle is the culmination of all those efforts. 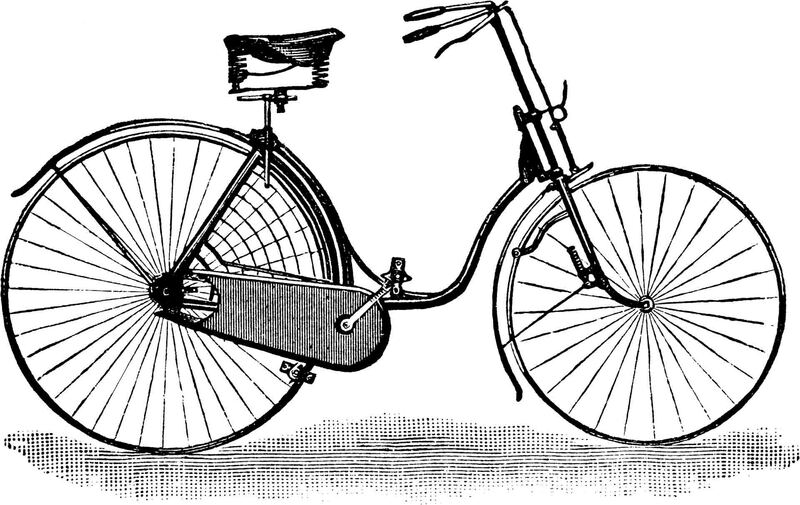 In fact, the bicycle as we know it remains virtually unchanged since its original invention circa the early 19th century. Ladies safety bicycle, 1889. Image source: Wikimedia Commons. Today, over 100 years later, modern bicycle manufacturers employ newer, stronger and lighter materials and more advanced industrial techniques, but the core design principles of the bicycle remain the same. As it turns out, improving upon what is already a near-perfect machine is a pretty tall order. On bicycles, humans become the most efficient animals in the world. 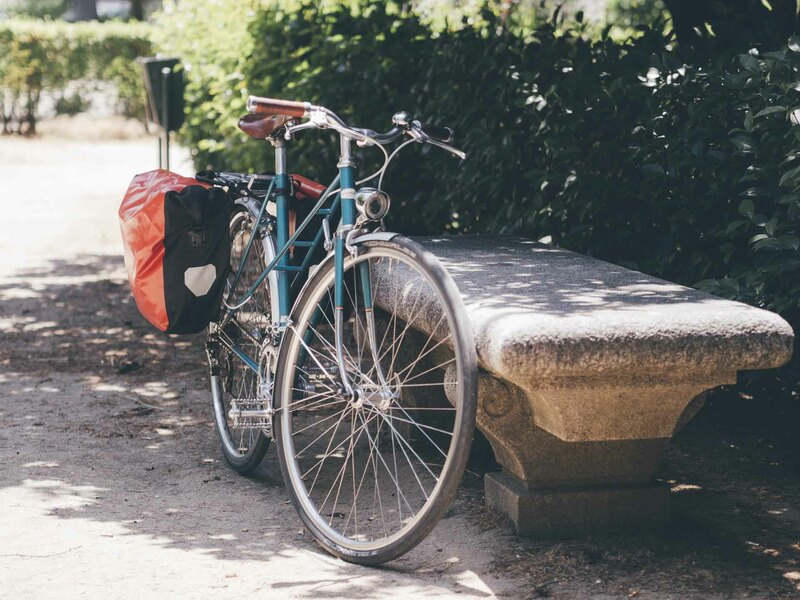 Whether you’re going for your daily commute or for a week-long adventure surrounded by nature, the bicycle is a great means of transportation that lets you easily move from point A to point B while staying in touch with your environment. Feeling the spring wind in your face as you pedal your way to your destination is one of the greatest pleasures of riding a bike. The bicycle is a very convenient means of transportation, even in large cities. Don’t believe it? You need only watch a kid’s face whenever they ride. That invariable expression of pure, unadulterated joy is a tell-tale sign that the bicycle is something special. However, even on a bicycle, the problem with moving around is that sometimes you need to take stuff with you. Like, lots of stuff. And while the bicycle itself excels as a load-bearing vehicle, our backs are not as well suited to the task. Carrying extra weight on the bike instead of your back is always the preferred strategy. 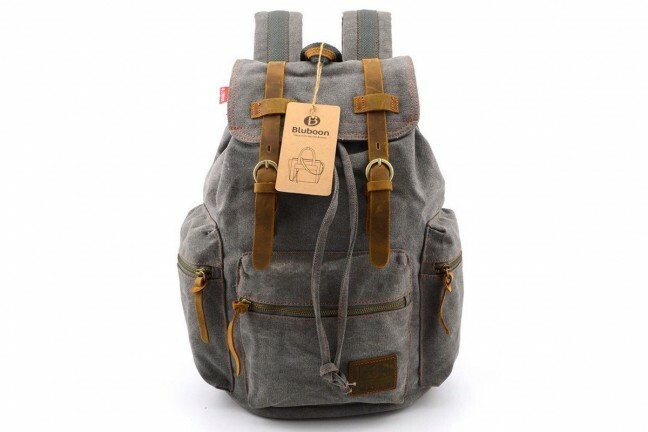 Backpacks are great for walking around because they free your hands. But on a bicycle, that advantage is moot. Instead of helping, backpacks put excessive strain on your back and — let’s be honest here — make you sweat profusely. 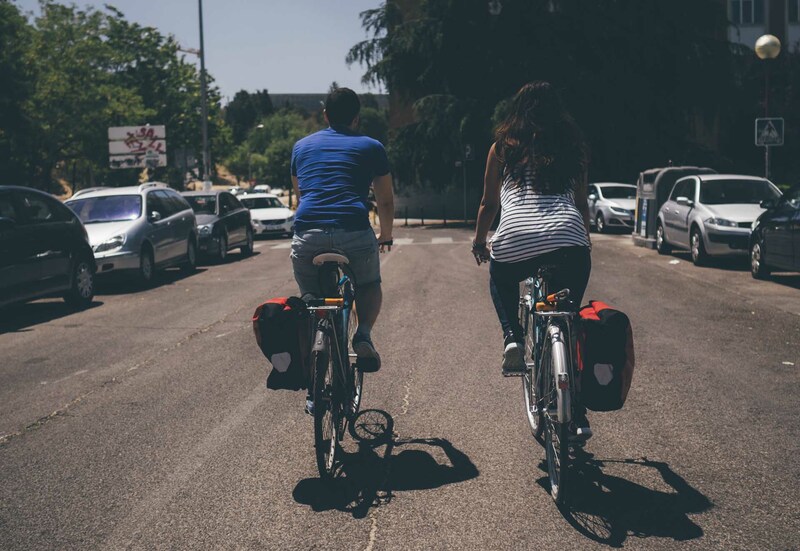 Indeed, carrying a heavy load on your back while riding a bicycle is not only inherently uncomfortable, it is also way less efficient, requiring substantially more effort on your part to get to your destination. The last thing you need when you’re going to a job interview is to look like you just ran a marathon in your suit. That’s actually the biggest reason why using a bike to commute to work gets a bad rap. People love excuses like “I can’t take a shower at work so it’s impossible for me to commute by bike”. It’s a nice sentiment and if your office is located atop the Alpe d’Huez you may have a point. For the majority of people out there though (those of us who aren’t trying to win a race), riding a bicycle and sweating need not go together. On a bicycle, the best way to carry your belongings is to let the frame do the hard work for you. Even when carrying a lot of stuff, it’s perfectly possible to cover moderately long distances on a bike without breaking a sweat. That’s precisely what the bicycle was designed for to begin with: to move heavy weight — our own body weight — around with ease. By placing the extra weight on the bike itself, we’re making the most out of the bike’s strengths and using them to our advantage. Which brings us to panniers. 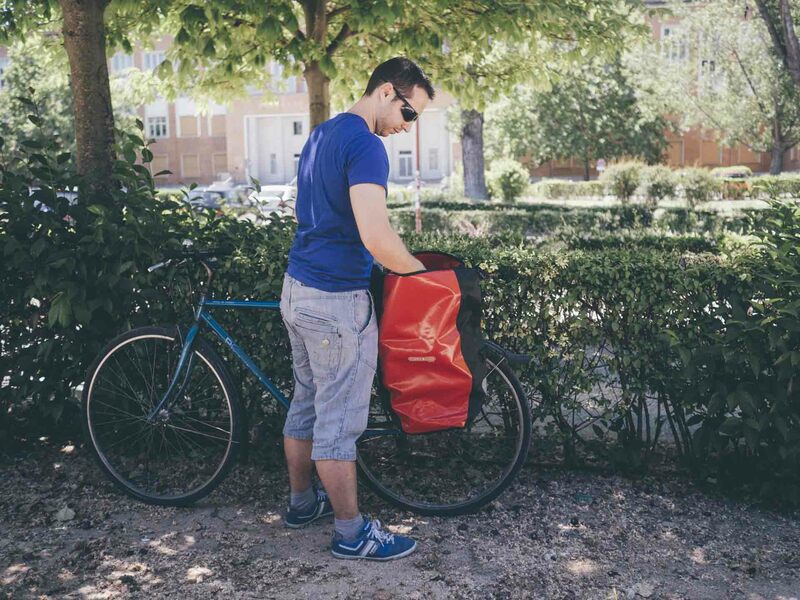 Panniers are special bags designed to be attached to a bicycle’s rack or frame. They are by far the most comfortable and efficient way to carry extra weight on a bicycle, essentially turning your bike into your own private mule, only without all the hair. 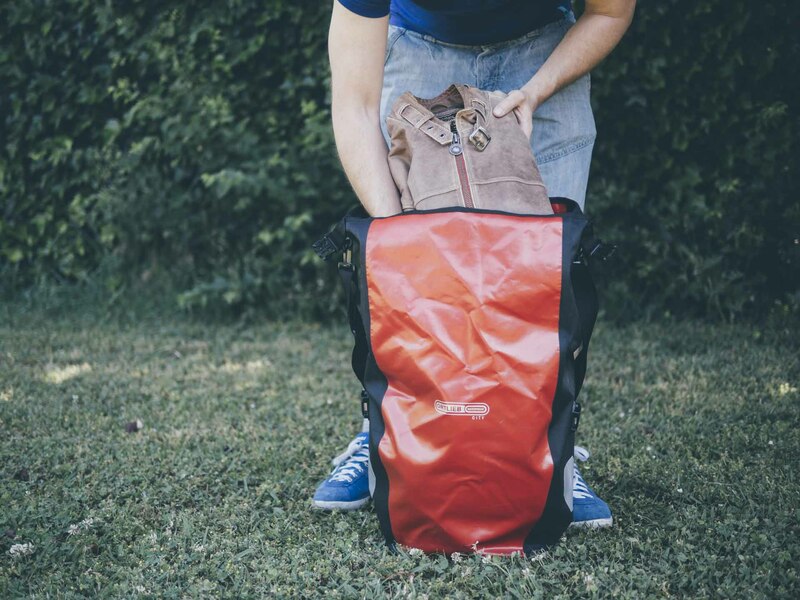 With the right kind of panniers, you can load anything from your everyday items to a full-on travel rig for a years-long expedition around the world. And yes, people do that all the time, too. Bicycle panniers: it’s like having your own private mule, only without all the hair. 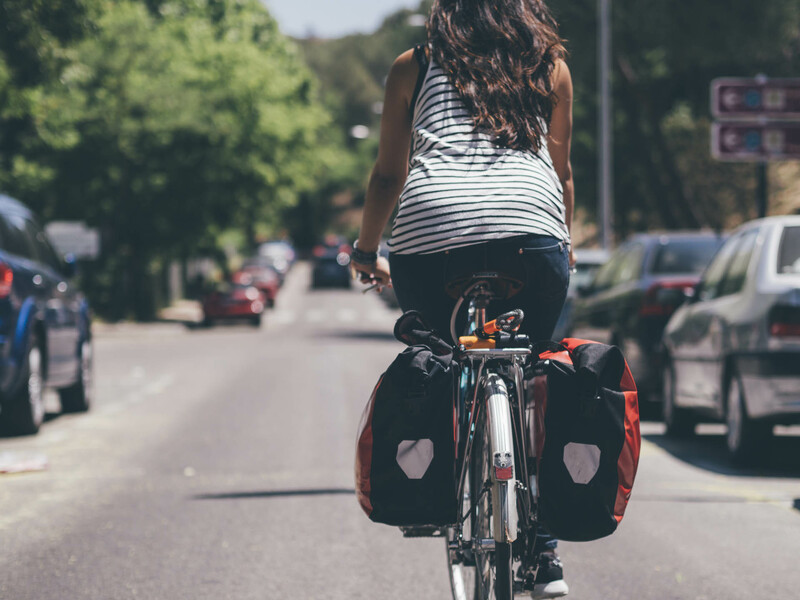 When you’re using panniers on your bike, your riding position remains unchanged, so there’s almost no change in the way you handle the bike. 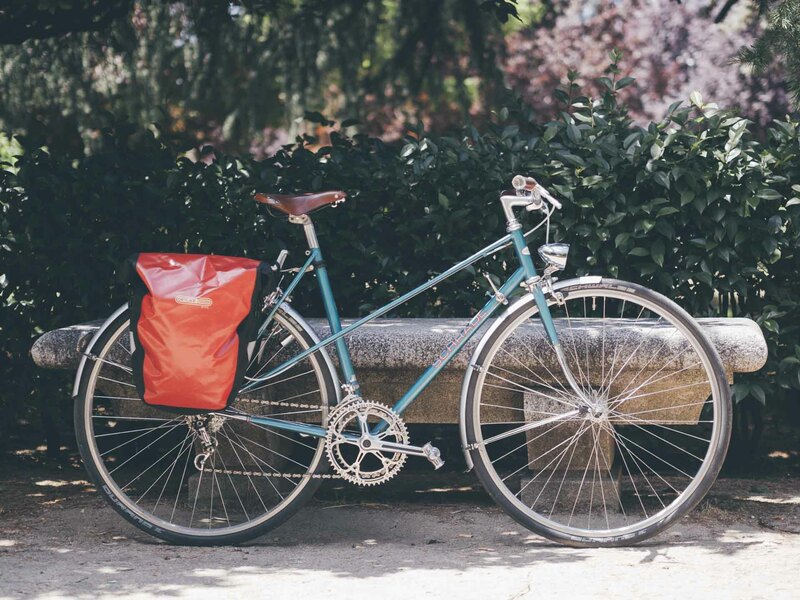 Depending on whether you use front panniers or rear panniers — or both — steering may be affected somewhat, but always in a predictable way that is easy to adjust to in a matter of minutes. Furthermore, your back remains free, which considerably helps reduce strain and sweat, two major factors people cite for not using the bicycle as transport in their everyday lives. 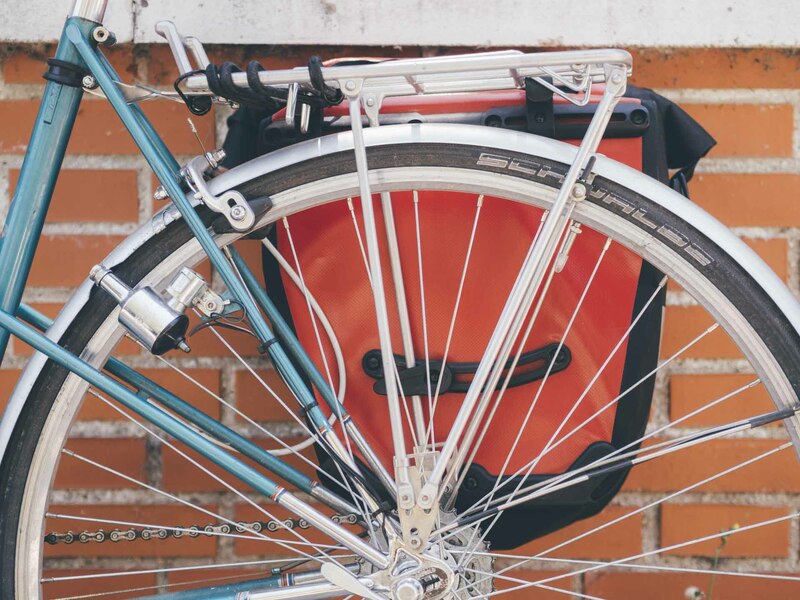 The way bicycle panniers usually work is by having special hooks designed to attach to the bike’s rack. These hooks typically exert pressure in two different directions in order to create the necessary tension for the bag not to bounce too much when the bike is darting through the types of uneven, pothole-ridden roads that are so common in many cities around the world. 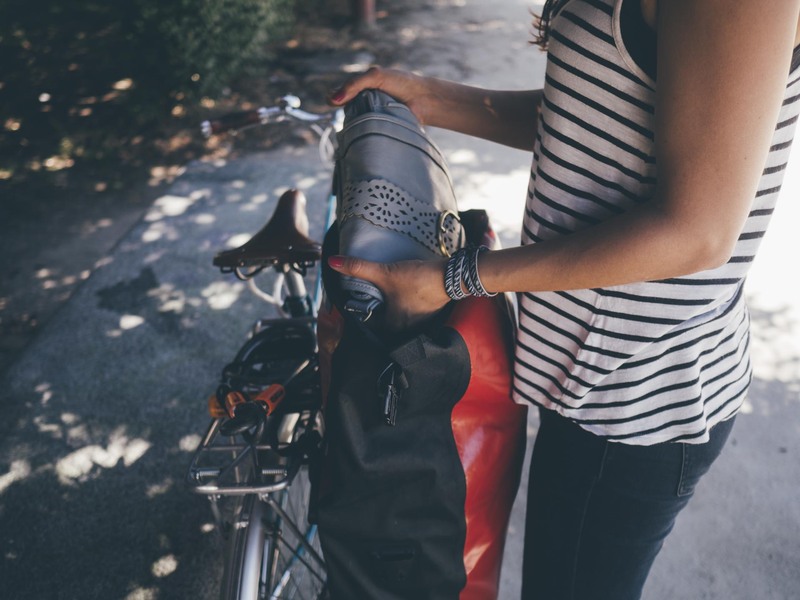 When they’re correctly attached, you shouldn’t need to worry about the bag coming off unexpectedly regardless of your riding style. The Back Roller City bicycle panniers, by Ortlieb. 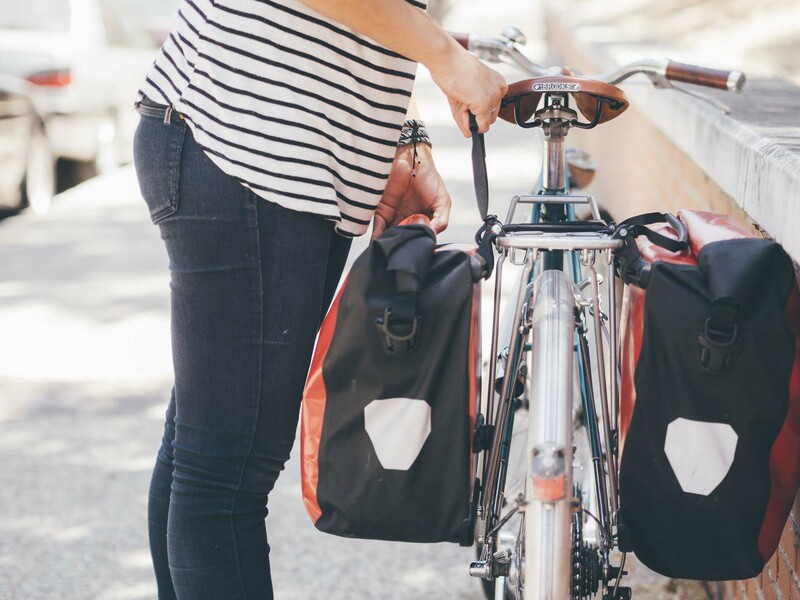 Good bicycle panniers also usually come in pairs, and feature top-loading designs that make it easier to take your stuff in and out of each bag while it’s mounted on the bike. 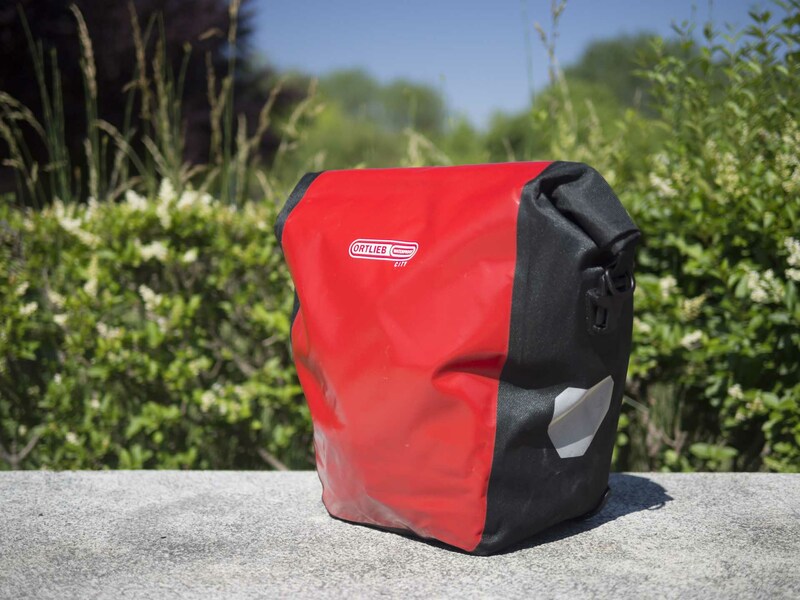 And since bicycle panniers are specialty bags meant to be used outdoors and under a wide range of weather conditions, it only makes sense that one of their most important features is weatherproofing. These seemingly basic but all-important features are what separate great panniers from the rest, and it’s here where German manufacturer Ortlieb shines. Hartmut Ortlieb founded the Ortlieb company in 1982 in Nuremberg, Germany. This was one of those cases when a person creates something out of necessity and in his case, that necessity was for high-quality waterproof equipment, which was unavailable at the time. As such, extreme waterproofing has been the cornerstone of the Ortlieb company during its entire history. In fact, the actual “Waterproof” word is featured rather prominently on the Ortlieb logo. Today, the company has grown to have over 140 employees, but everything the company does is still located under one roof in Heilsbronn, Germany. Their “Made in Germany” policy is one of their most treasured traditions, which they view as a symbol of high quality products that perform equally well under all sorts of conditions. Other trademark features in Ortlieb’s products include roll closures, waterproof zippers, Velcro closure or sliding seal closures. All of these contribute to the overall robustness and durability that is so often associated with the brand. The Back Roller City bicycle panniers, by Ortlieb. Shoulder strap not included. 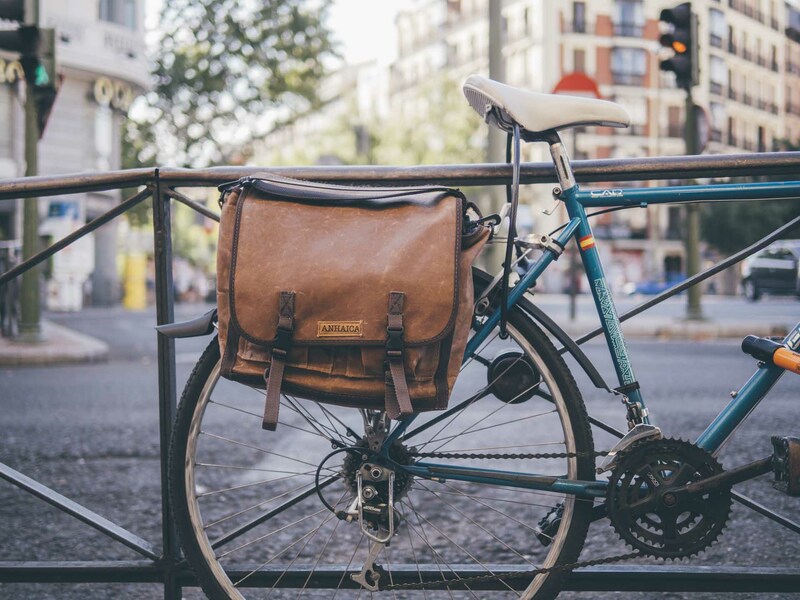 Their signature Back Roller Classic panniers are renowned around the world for their incredibly tough construction and completely solid waterproofing. 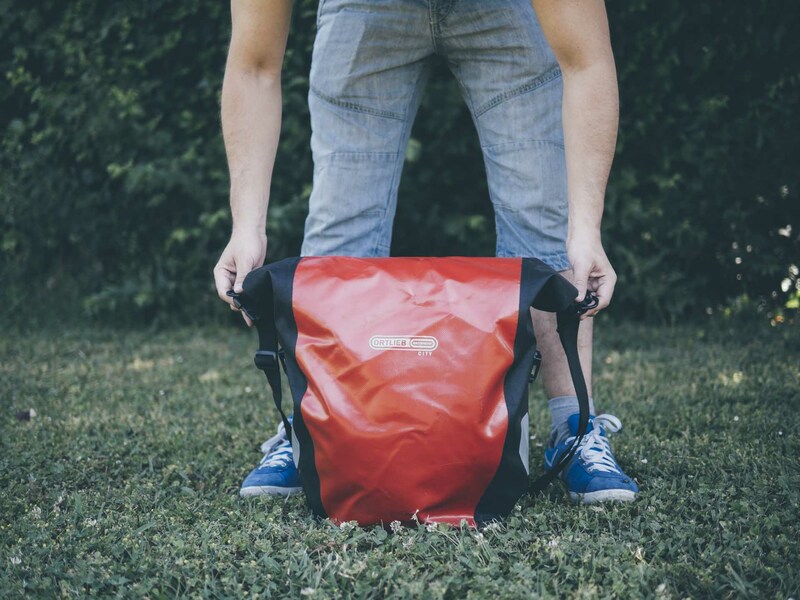 Unfortunately, higher quality usually comes with a higher price tag and Ortlieb products are no exception. This is why, with the addition of a more affordable model that apparently retains most of these high-end features, the company has managed to shake things up quite a bit. The Back Roller City panniers are precisely that model, but how well do they stack up against their tried-and-true siblings? Let’s find out. Let’s state it up front: the Back Roller City bicycle panniers are a weird creature. Typically, the way most companies go about creating an entry-level product is by compromising on some of the best features in order to try to upsell potential customers to the more expensive models. That creates the perception that the company caters to the lower segments of the market, while maximizing revenue and avoiding cannibalization of the products that really matter to the company’s bottom line. On the surface, the Back Roller City appear to fit that description but, as you start looking more closely, the analogy falls quickly apart. 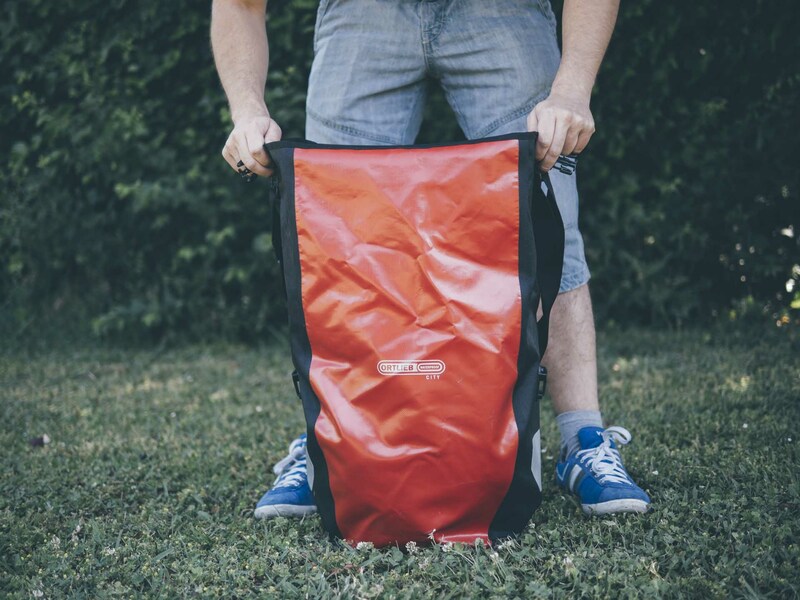 Instead of being a gimmicky product, these are Ortlieb panniers through and through. All of the trademark features are there: Welded seams? Check. Roll closure? Check. Their patented QL1 hooking mechanism? Check. Fully waterproof? You get the picture. Indeed, upon further inspection, these panniers appear to be the greatest bargain in Ortlieb’s history. The Back Roller City panniers come in pairs and are available in black, white or red, giving you a chance to go for a more discrete look or to go all-out and make a bold statement. Given that visibility is an important factor when riding a bike, we recommend the red ones, as reviewed here. That said, they’re all equally well built, so it’s entirely a matter of personal preference. 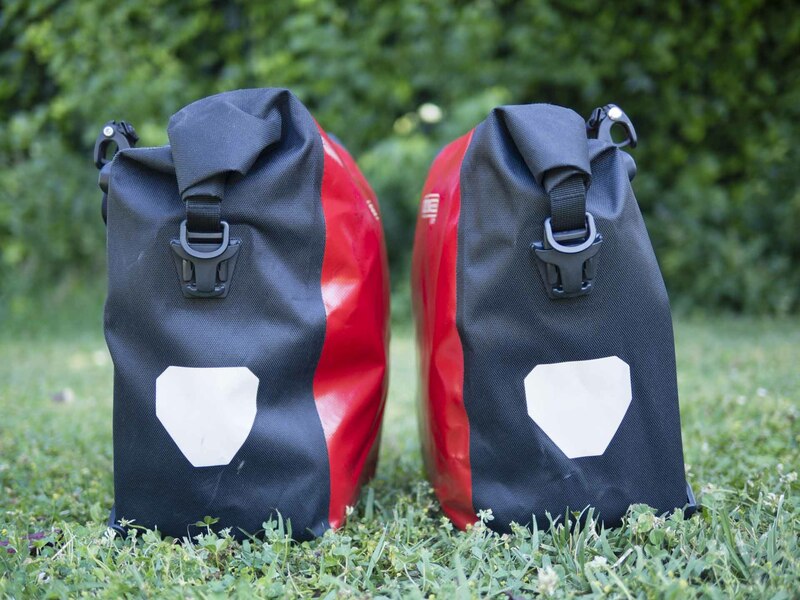 The Back Roller City panniers come in red, black or white. Regardless of your color of choice, the sides and the bottom of each pannier are black and have a different, less plasticky texture. Not to worry though, because this area is just as water resistant as the rest of the bag. 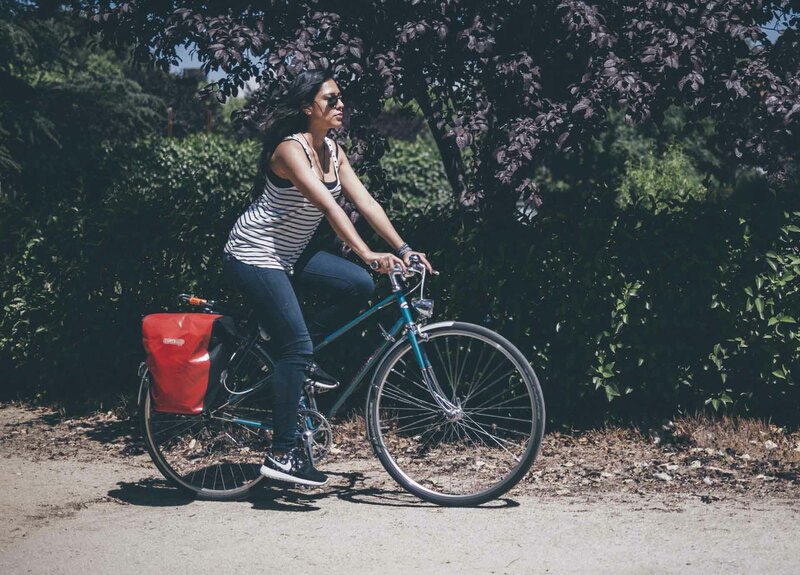 Each pannier has a volume of about 20 liters, meaning one of them will be enough to meet most people’s daily needs. And with a combined 40-liter volume between the two of them, there’s plenty of space for the occasional trip or excursion, too. 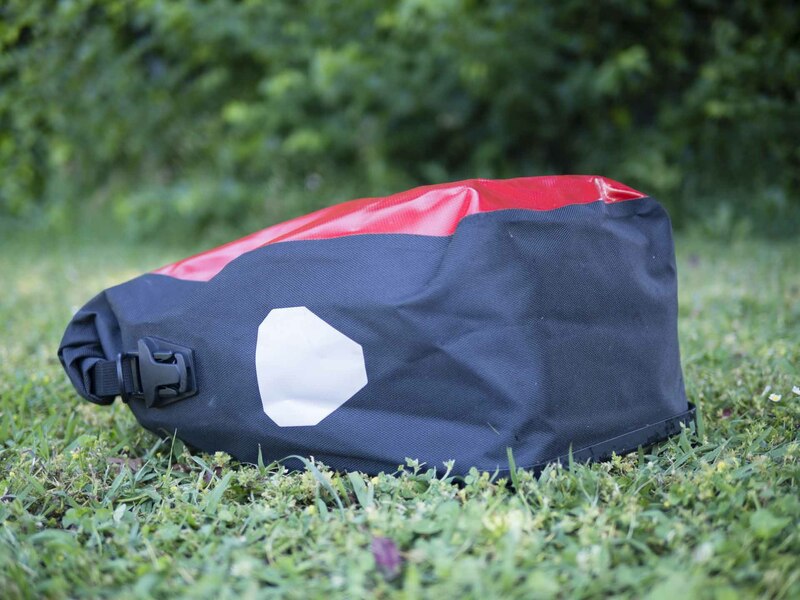 Each pannier has a patch of reflective material on each side in order to increase visibility. Since both panniers can be mounted on either side of the bike, they feature a patch of reflective surface on each side, which helps increase visibility for the rider. This is a nice detail that betrays Ortlieb’s experience in designing bicycle-related equipment. 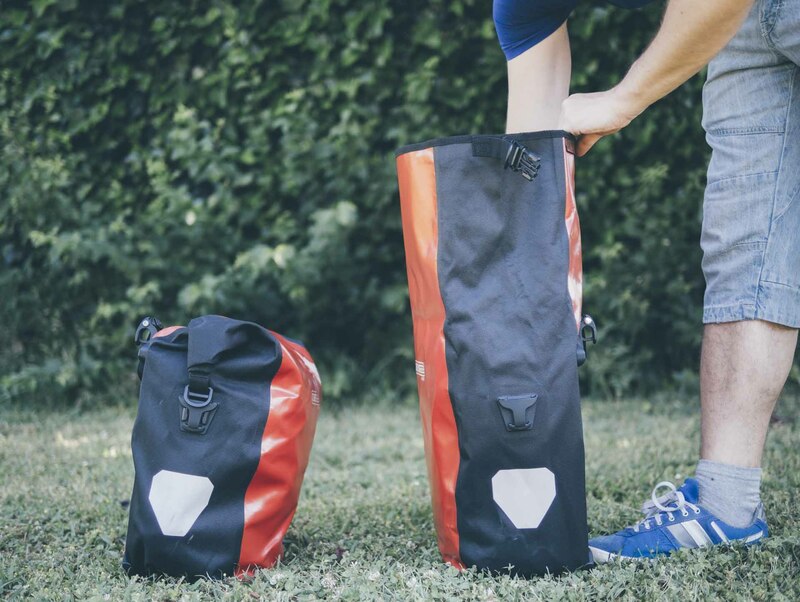 Other than that, these panniers are remarkably simple, with a slanted shape that helps get rid of excess water as well as offering increased clearance for your feet in the lower area, which makes pedaling more comfortable. 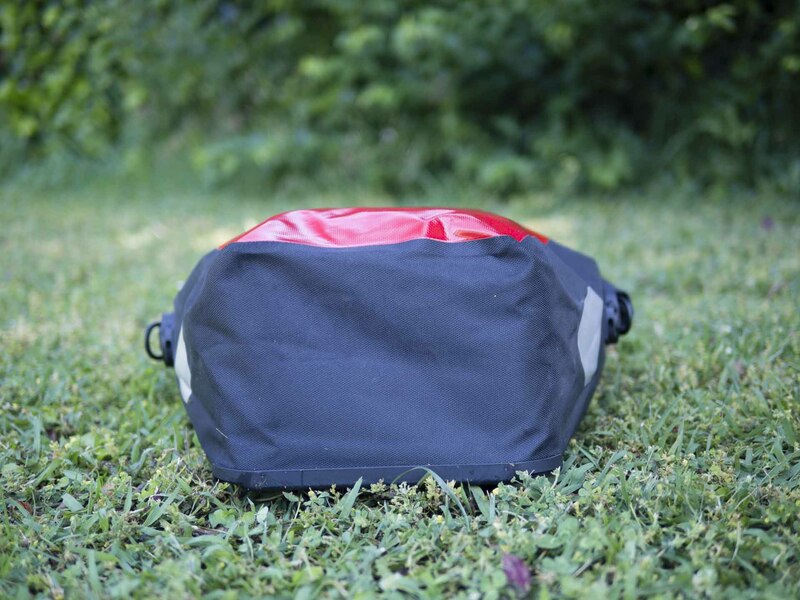 The bottom of each pannier is reinforced by a rigid structure to ensure they retain their shape. 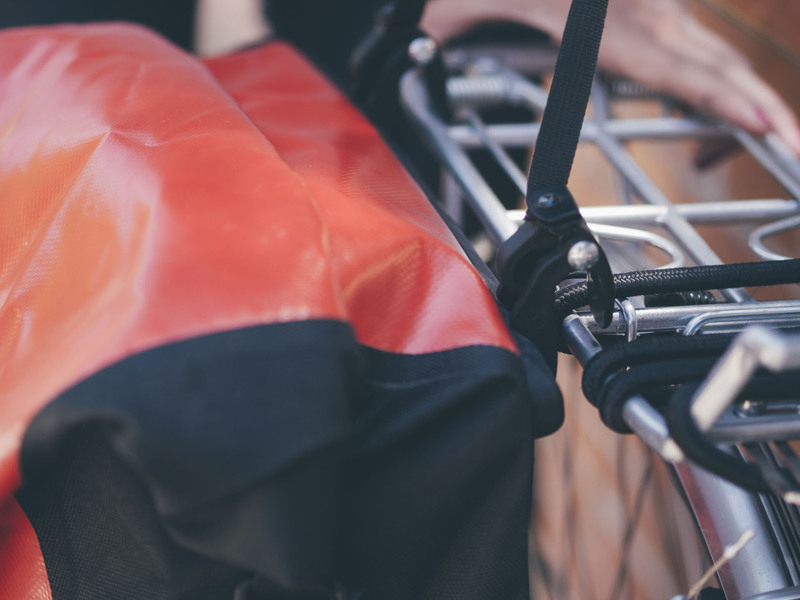 The structure of the panniers is also reinforced by a rigid frame, and the back side includes a rigid plastic sheet to increase stability when the bags are mounted on a rack. The Back Roller City feature a classic roll-top closure that is quick and easy to use and ensures no water can get inside, no matter how heavy a downpour you manage to find yourself under. The classic roll-top closure helps keep water at bay. Once you roll down the top side of the bag, there’s a buckle on each end that attaches to the corresponding buckle on both sides. This is one of the areas where the Back Roller City are different from other Ortlieb bags. In some other models like the Classic, you can clip these buckles to each other or even to the shoulder strap. This makes it possible to overfill those bags in a way that can’t be done with the City. 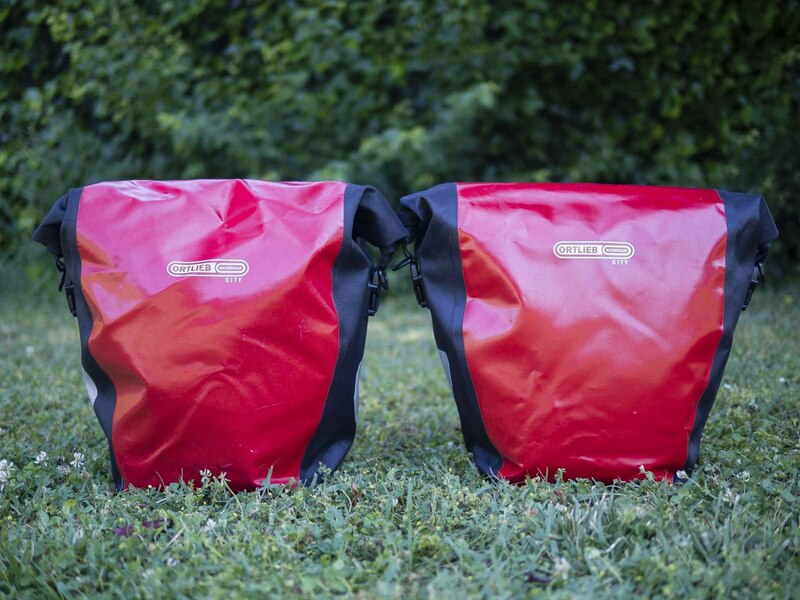 These panniers definitely live up to Ortlieb’s excellent waterproofing standards. 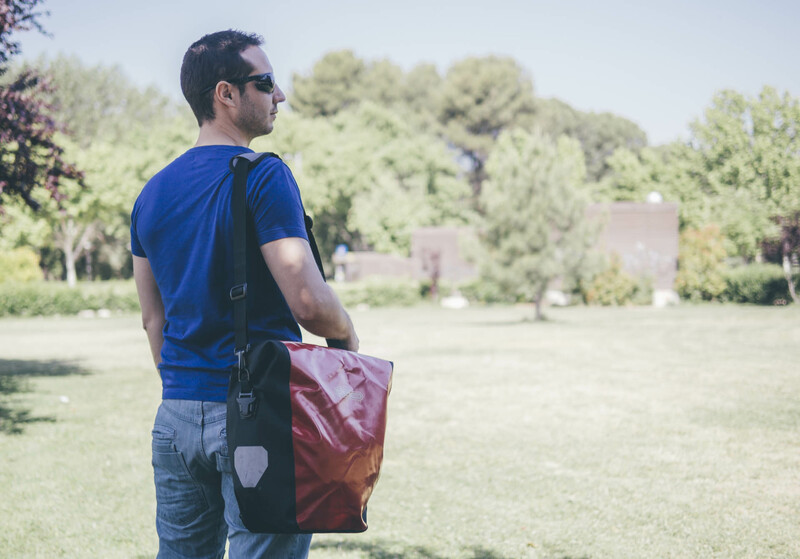 With welded seams and 100% waterproof materials, you can rest assured everything you put inside will stay safe and dry no matter what. Unless the physical integrity of the bags is compromised, you submerge them in a river and let them stay there for a week, there’s simply no risk of getting any of your items wet. The interior of the Back Roller City is as simple as it gets. There are no internal pockets or dividers, which is another thing that separates this model from others in the lineup. Instead, there’s a single massive compartment that will house everything you put inside. In practice, this single compartment works well, provided that you use some means of organization to segregate your items, like packing cubes, pouches, etc. 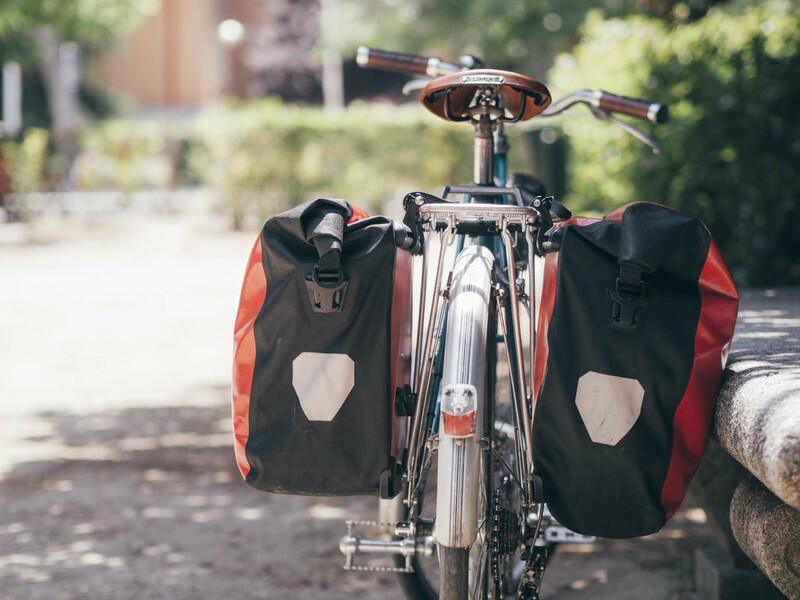 By taking advantage of the slanted shape, it is possible to arrange items in such a way that minimizes movement inside once the panniers are closed. The slanted shape of these panniers is just the right size to fit a camera bag like the Think Tank Retrospective 5 at the bottom and a travel tripod like the SIRUI T-025X on top of it. This way the Back Roller City becomes a quite handy camera bag in its own right. A word of advice, though: don’t place fragile items too close to the back panel. There are several protruding caps on the edges of the plastic framesheet and if a delicate item was to get banged up against them, it could get damaged. The best way to ensure this doesn’t happen is to place an item of clothing — like a T-shirt or a rain jacket — immediately on top of the plastic sheet. This will provide sufficient padding for the more delicate items. These small protruding caps on top of the plastic framesheet could damage some delicate items if they’re not placed carefully inside the bag. Arguably, the most important aspect of pannier design is the hooking mechanism. In order to be useful, it’s not enough for a pannier to be waterproof, or tough. 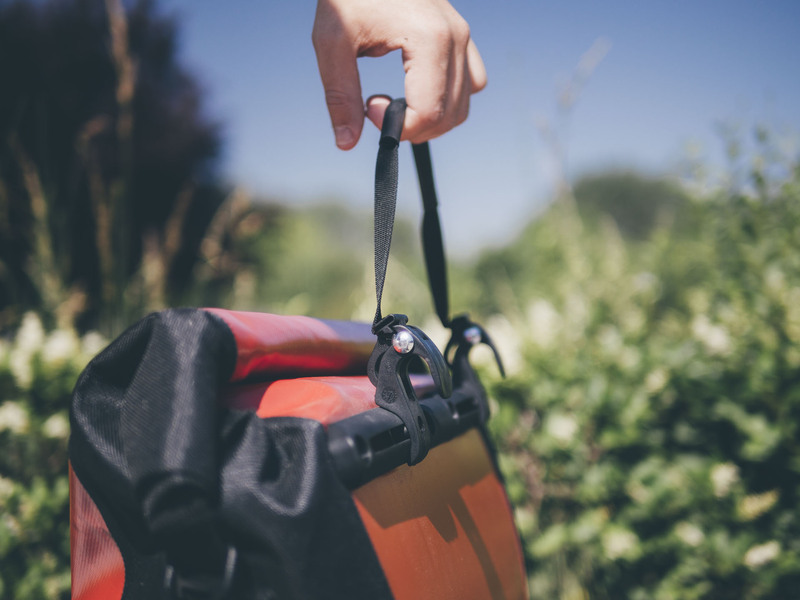 Those are bonus features, but if we are to trust a bag with our valuable belongings, we need complete and total assurance that the pannier will not come off by accident, and that is where the hooking mechanism comes in. 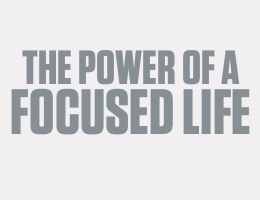 It is an absolutely mission-critical component. 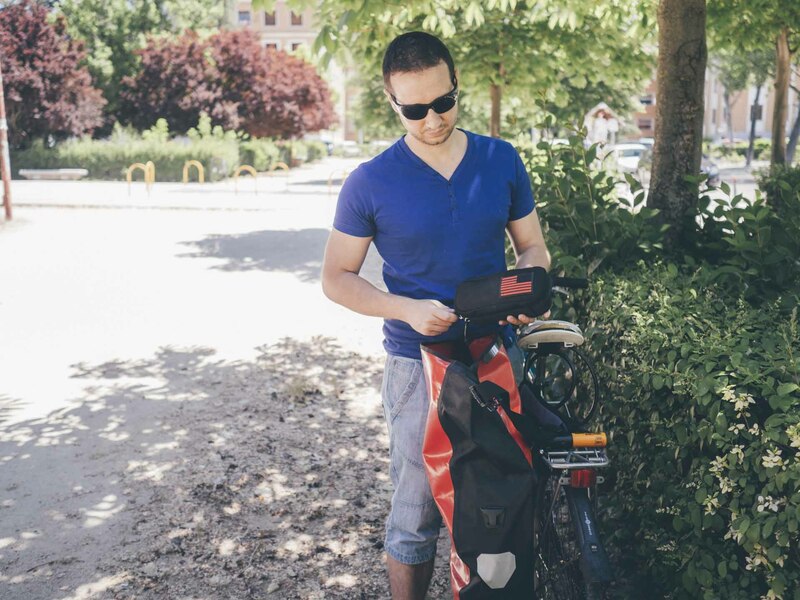 A great hooking mechanism will not only provide that assurance, it will also provide the flexibility to adapt to most bicycle racks, and the ease of use to make sure that using the bag every day is not a burden, but a mere afterthought. 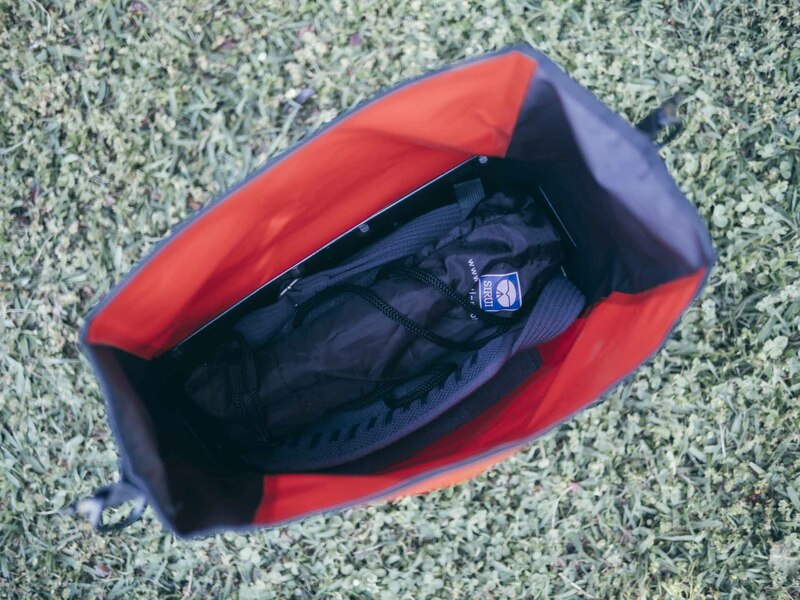 One of the greatest advantages of Ortlieb bags vs the competition is their patented QL1 hooking mechanism. It’s a brilliant design that meets all of those criteria, and then some. 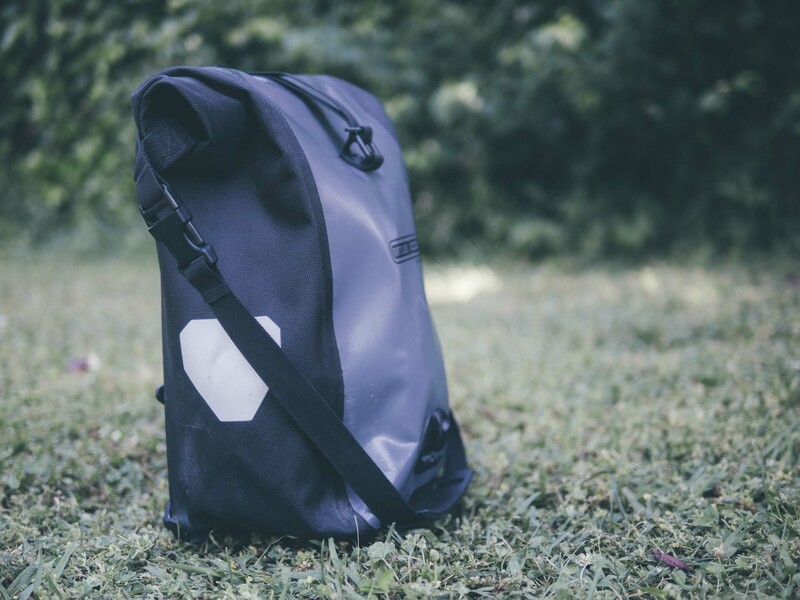 The QL1 system is composed by three parts that work together to make it extremely easy and secure to attach and remove the pannier from our bicycle. On the back panel of each pannier there are two retention hooks, located in the upper part and connected by the carrying handle. Near the bottom, there’s an additional hook to provide extra stability. The upper retention hooks are designed to attach to the rails of a bicycle rack, and can be adjusted laterally to ensure a perfect fit no matter what particular rack model you own. These hooks are compatible with racks of up to 16 mm in diameter, and there are additional hook inserts included to ensure compatibility with narrower racks, of up to 8 mm or up to 11 mm in diameter. The QL1 hooking mechanism is one of Ortlieb’s greatest strengths. The additional hook near the bottom can be pointed towards either the left or the right, enabling each pannier to be mounted on the left-hand side or the right-hand side of the bicycle. 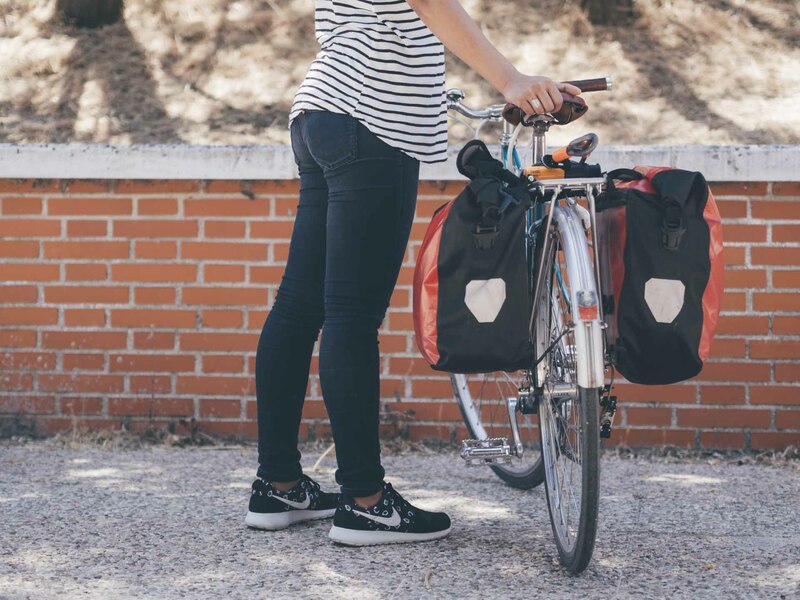 Instead of carrying both panniers at the same time on your bike, you could use both panniers as right-hand panniers on two different bicycles, for example. This hook can also be moved laterally to achieve the best possible fit with your particular rack. The hook near the bottom provides extra stability when riding. The way the QL1 system works is simple, but incredibly clever: by grabbing the bag by the handle and pulling upwards, the retention hooks come loose and the entire bag can be mounted or unmounted with ease, even using only one hand. The great part about it is that the pannier’s own weight is what makes the system work, so effectively you don’t even need to think about it. Just grab the bag by the handle and it will immediately come off, as if by magic. And since the retentions hooks are closed around the rack rails the second you let go of the handle, there’s simply no chance of the bag accidentally coming off the bike, no matter how aggressive your riding style, or how bumpy the road may be. Unmounting the panniers is as simple as grabbing the handle and pulling upwards. It’s so easy it can be done with a single hand. If delight is in the details, the QL1 hooking mechanism is a truly delightful system. The Back Roller City’s design could certainly be described as spartan, but Ortlieb has a range of accessories available that will help customize and enhance their feature set. However, keep in mind that buying several of these accessories separately means you’ll quickly end up paying more than you would have if you had instead bought a higher end model that comes with those features built in. It’s always a good practice to think about these things before purchasing. Notebook Sleeve: If you want to carry your laptop, this rugged sleeve will protect it against occasional bumps. 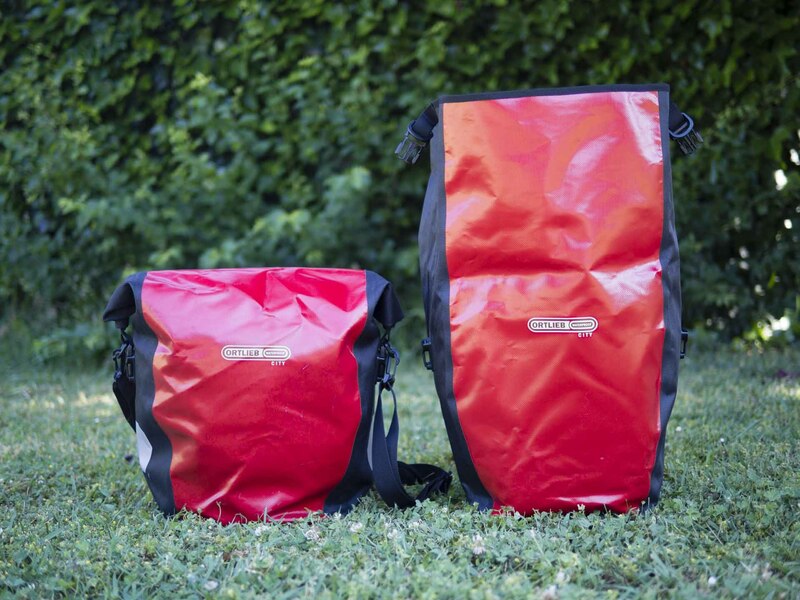 Carrying System: All Ortlieb panniers can be transformed into backpacks with this handy carrying system. It’s not the most elegant solution, but it beats having to lug them around by hand. 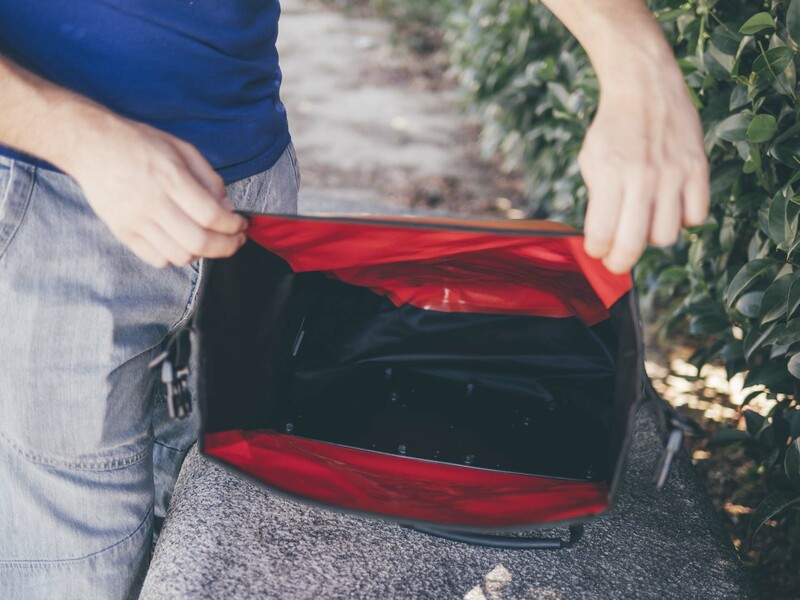 Outer Pocket: If you want to keep a few small items accessible from the outside of the pannier, these pouches will allow you to do just that. Camera Insert: Moving quickly from one location to another is vital for photographers. 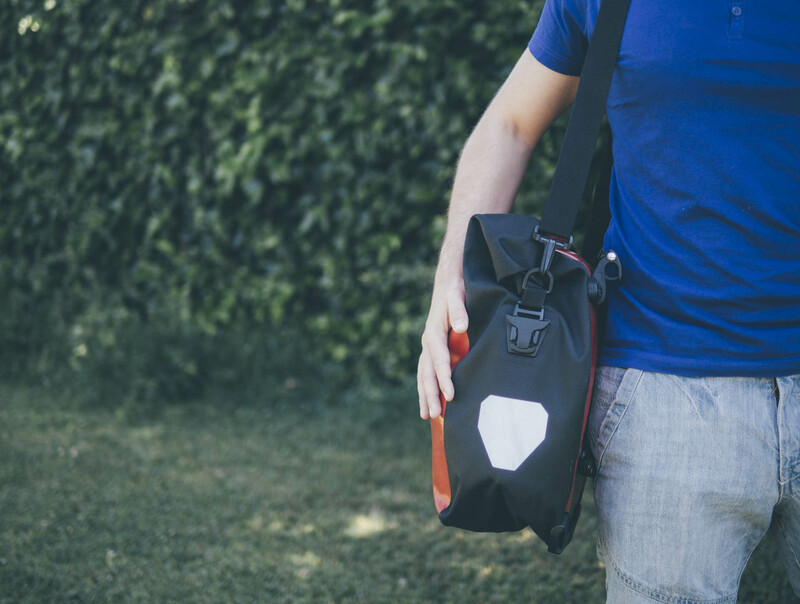 With this camera insert, you can safely carry all your photo gear on your bike with ease. The Back Roller City panniers are remarkably easy to use as part of your daily routine, but in some cases they may be overkill. Unless you have to carry a massive amount of gear and clothing every single day, you probably won’t need to carry both panniers with you. 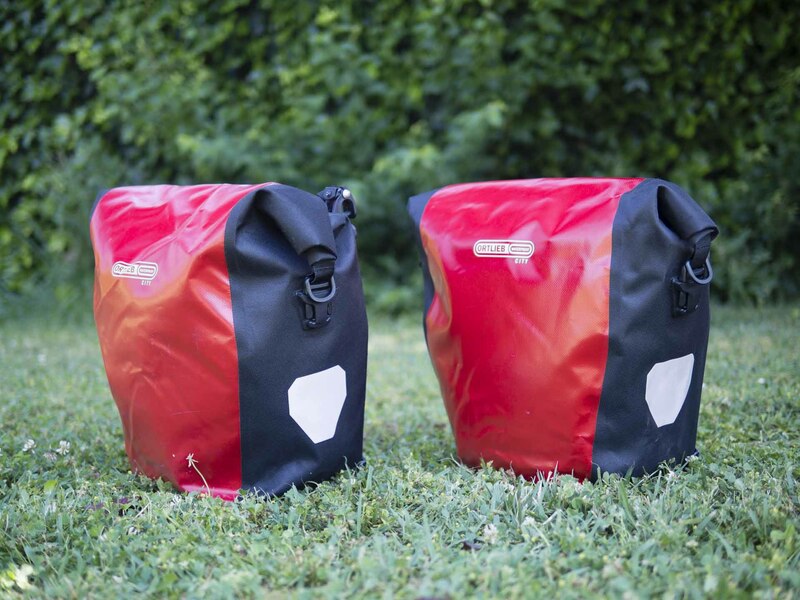 Luckily, although these panniers come in pairs, they were designed to be used independently, so there’s nothing stopping you from using only one of them on a daily basis and leaving the other as a backup, or for special occasions like weekend trips, touring rides, etc. If you’re going to use them on a daily basis though, you could probably use a shoulder strap to make them easier to carry once they’re off the bike. Unfortunately, the Back Roller City, unlike the Classic, do not come with an included shoulder strap, so you’ll have to procure one separately. The good news is, almost every clip-on shoulder strap out there will work just fine. Riding a bike with a mounted pannier is surprisingly easy to get used to, and the Back Roller City are no different in this regard. In fact, most people won’t even notice they’re back there after just a few short minutes. 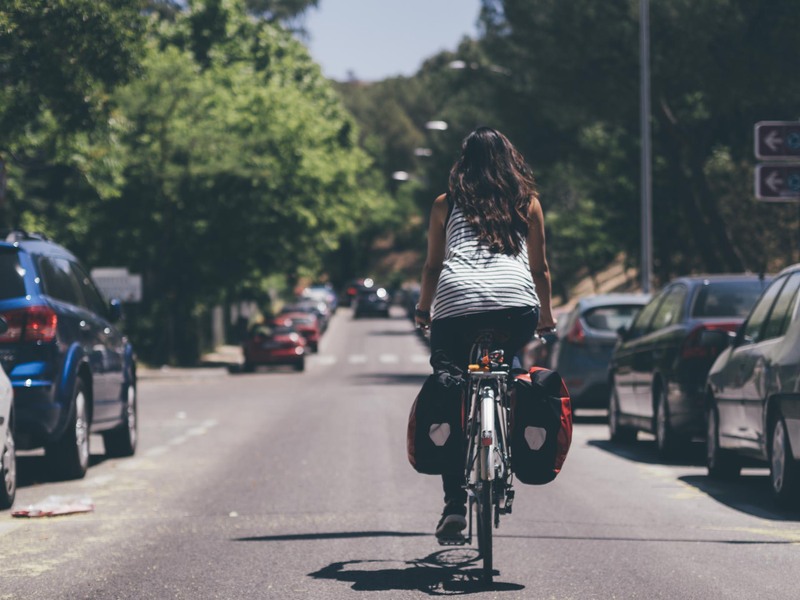 However, even if it’s not always noticeable, panniers do affect steering and maneuvering, so be sure to practice for a while before riding on busy roads. Most people won’t even notice the panniers are back there after just a few short minutes. 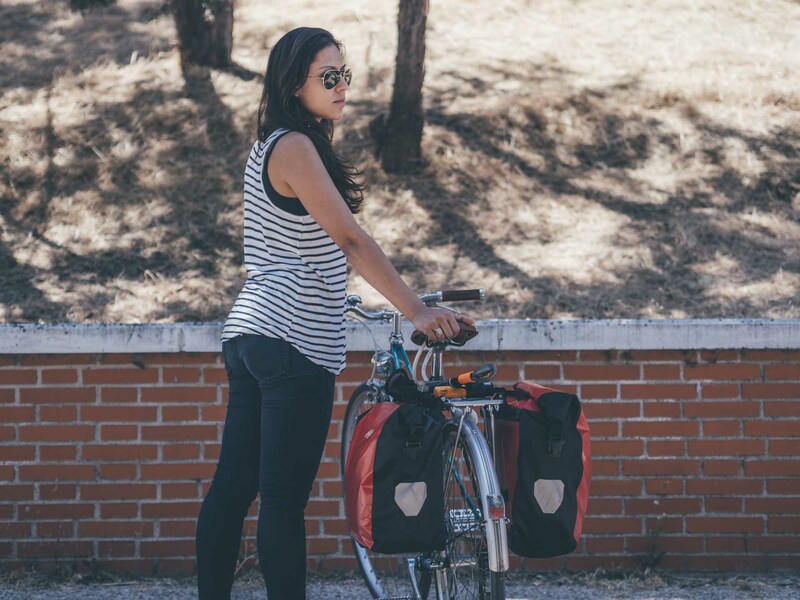 There’s another important thing to consider when regularly using panniers: theft risk. Some models are designed to stay mounted on the bike at all times, but others like the Back Roller City are supposed to be taken with you. Whatever you do, make sure you don’t forget them on the bike because if you do, chances are they’ll be long gone by the time you come back. Yes, it sounds silly. Yes, it’s happened before. 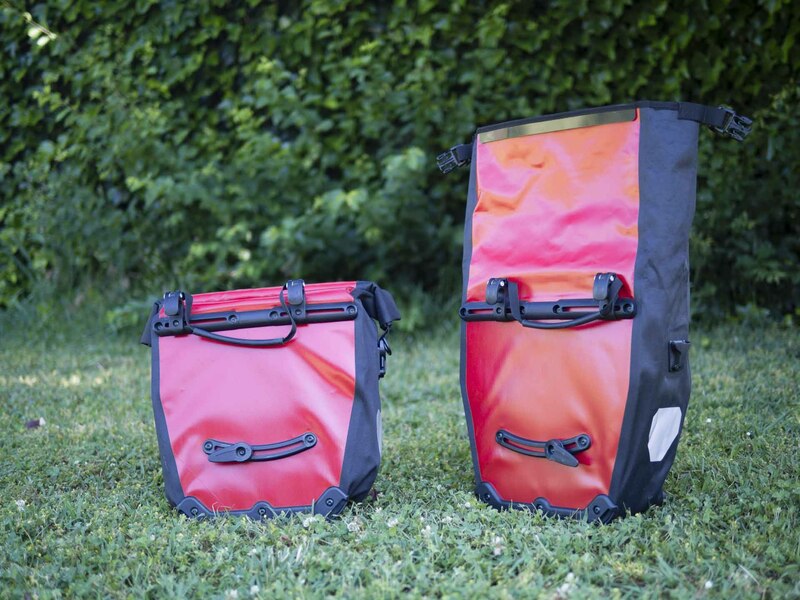 Even while you’re riding, these panniers are so easy to unmount that somebody could sneak up on you and lift them in a matter of seconds. If you can, use your cable lock and thread it through the handle in order to create a temporary deterrent and avoid these opportunistic thefts. Clearly, you should’t leave them on your bike and unattended under any circumstances, but this way at least you’ll be safe while you’re riding. Some internal compartments: This is one of the features that were compromised in order to differentiate the Back Roller City from other Ortlieb models. Still, having precisely zero internal dividers seems a bit extreme. Having some internal compartments would make organization a lot easier. Included shoulder strap: Like the previous point, Ortlieb doesn’t include a shoulder strap with the City in order to differentiate it from other models like the Classic. We understand something has to give, but this is such a basic feature that we would have liked to see it make the cut. More colors: Black, white and red are nice, but where’s yellow? And what about blue? Orange? Green? Ortlieb is clearly limiting the City to only three basic colors to steer customers up to the more expensive models, which is a shame. Safety measures: To the best of our knowledge, none of Ortlieb’s models have any built-in safety measures to thwart opportunistic thieves. Something as simple as including a locking lever on the retention hooks would make it a lot more difficult to unmount the panniers without alerting the rider, for example. These panniers are so easy to unmount that it’d be nice to have some anti-theft features built in. 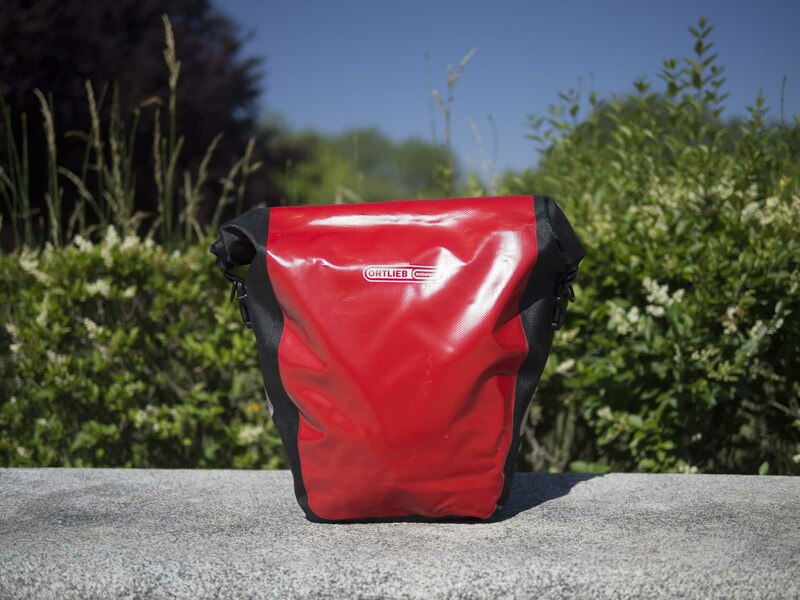 The Back Roller Classic, or any of Ortlieb’s other panniers. If your budget allows for it, the higher end Ortlieb models are undeniably better than the City. 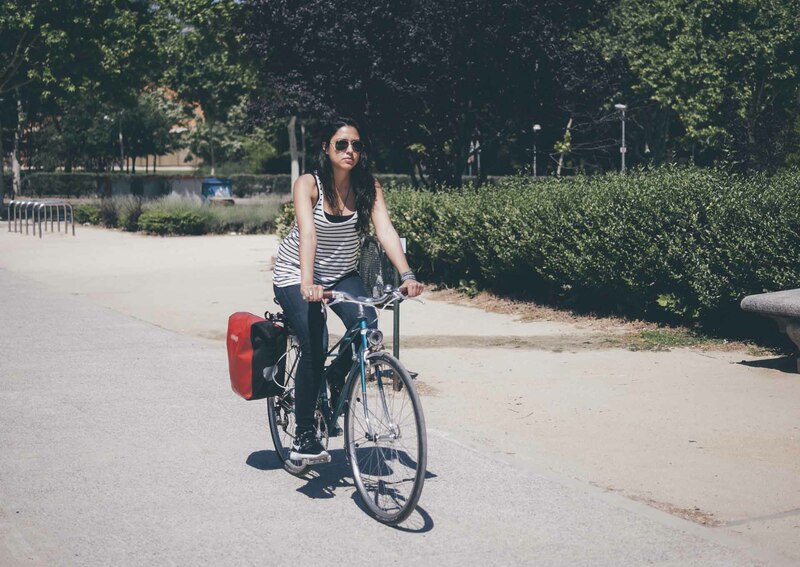 Plus, you can choose among many different types of panniers: front-loading ones, smaller, bigger, you name it. 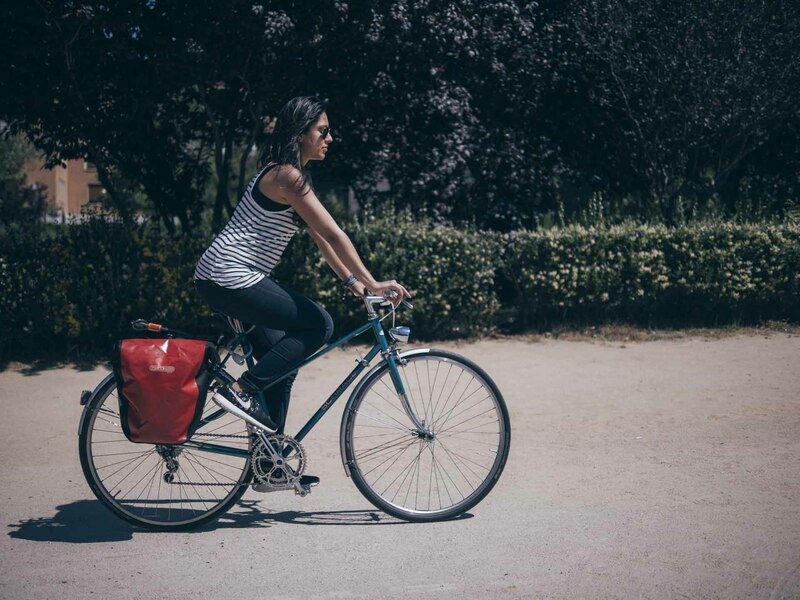 The Back Roller Classic panniers are a more expensive alternative to the City. Anhaica Bags. 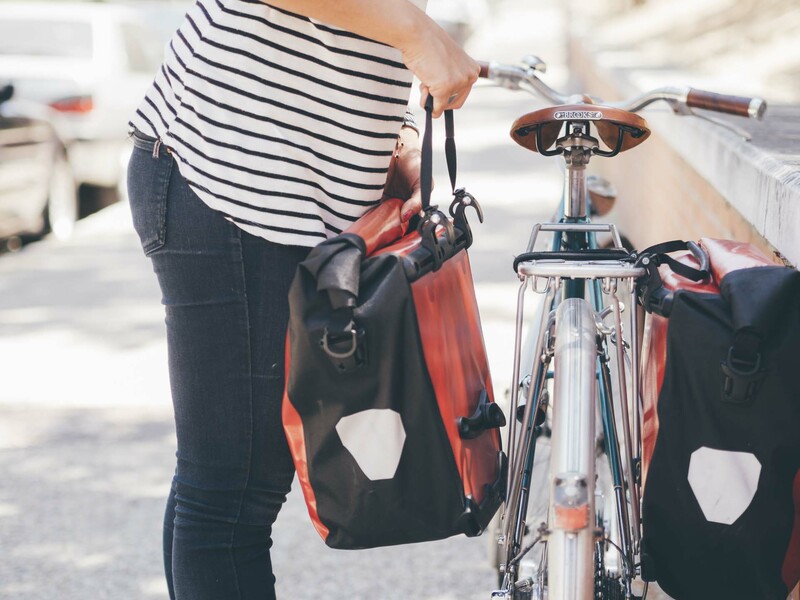 If you appreciate craftsmanship above all else, Anhaica Bag Works creates some incredibly gorgeous bicycle panniers. These are made from hand-waxed canvas in Tallahassee, Florida, and they come in a variety of shapes and sizes, all of which are equally stylish and gorgeous to look at. They even have some panniers that transform into messenger bags and backpacks when you’re off your bike. 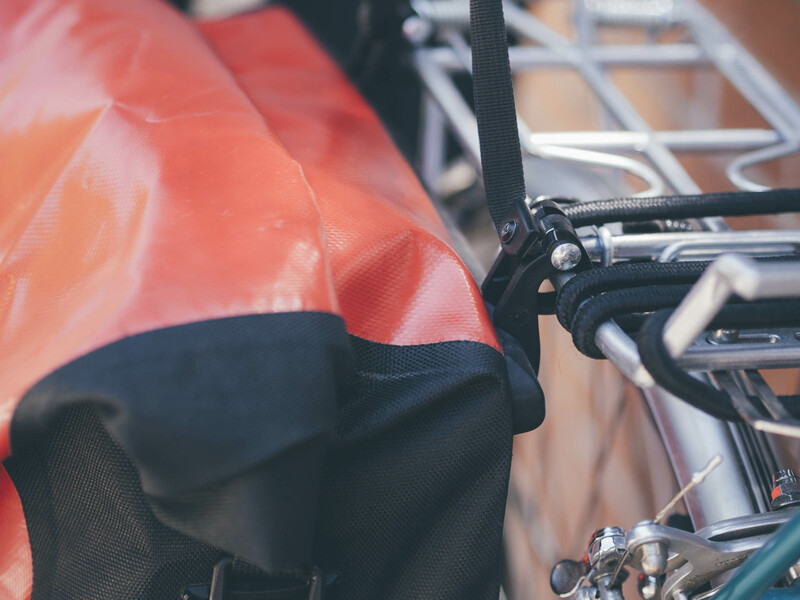 Anhaica bags use either standard MEC clips or a simple hook and bungee system to mount to your rack. These systems are not as advanced as Ortlieb’s QL1 hooks, but they’ll get the job done just fine. Lastly, they also include Velcro flaps to cover the clips when you’re off your bike to prevent any accidental hang ups. 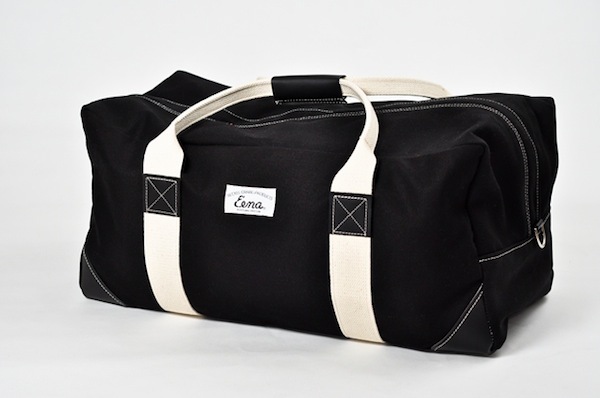 A waxed-canvas messenger pannier by Anhaica Bag Works. 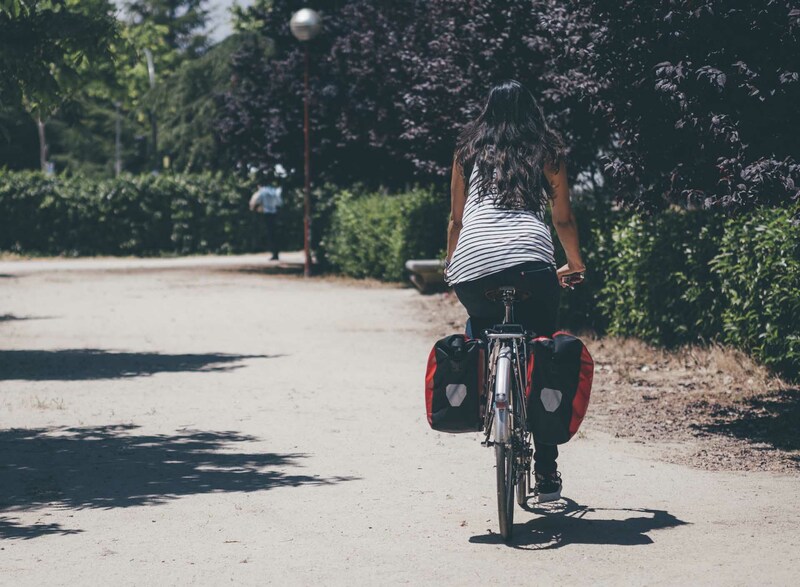 The Back Roller City panniers by Ortlieb are one of the most interesting options available for people that want something durable, sturdy and reliable for their daily needs. 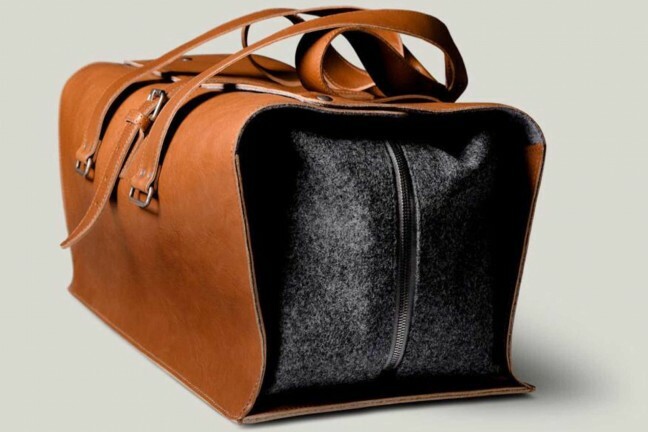 These bags somehow managed to inherit all major features traditionally found in more expensive models, while still maintaining a very reasonable entry price. But while their great balance of price vs features may be what piques your interest, the real treasure is what they’ll do for you once you own them: if a set of panniers like these can encourage you to get out and use your bike more, it will be the smartest investment you’ll ever make. Steve Jobs once said about computers: “it’s the most remarkable tool that we’ve ever come up with, and it’s the equivalent of a bicycle for our minds”. This is one of the coolest bicycle analogies ever made and the greatest thing about it is, Jobs wasn’t exaggerating the historical relevance of the bicycle one bit to make his point. 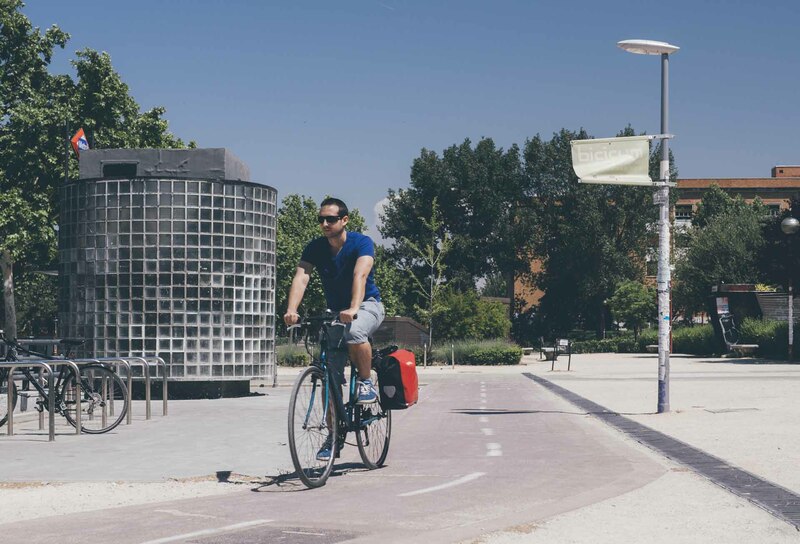 The bicycle has been a symbol of livable cities and sustainable transport for over a century, but its strong resurgence in the past decade points to a greater truth: the bicycle is not a fad, it never really went away and it is indeed here to stay. 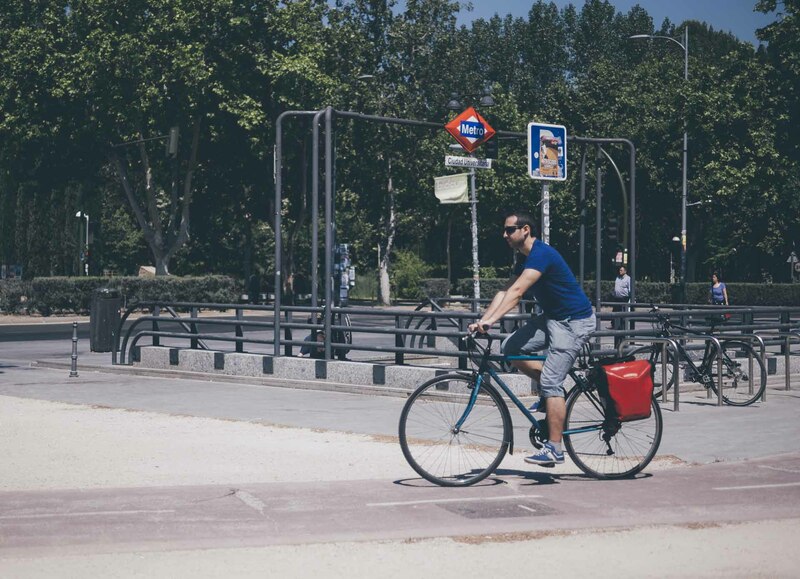 With the right kind of equipment, it is entirely possible to use the bicycle as a primary means of transportation, even in large cities around the world. We’re already seeing it in places like New York, Paris, Tokyo and many others, where public bike share schemes have already planted the seed in people’s minds. As a result, the numbers of citizen cyclists in those places have exploded in recent years. But using a bicycle as transport is very different from using it to burn calories. 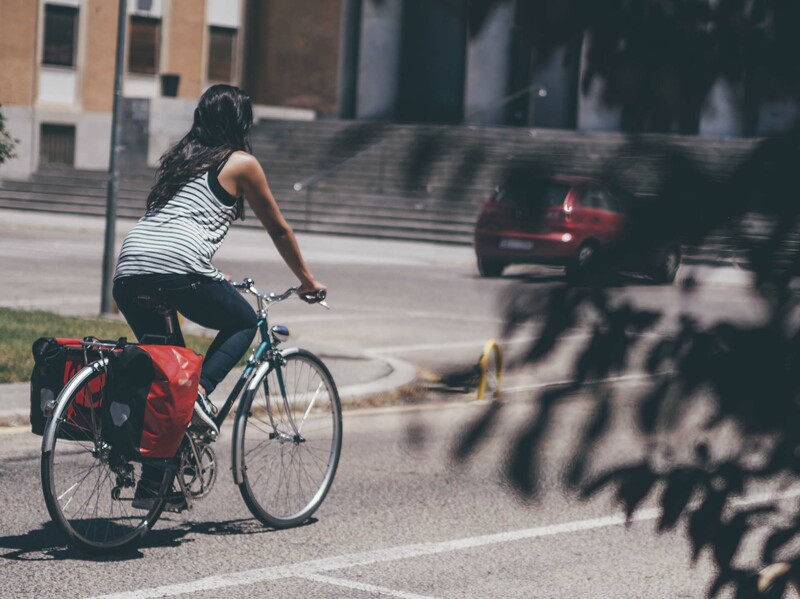 By using panniers like the Back Roller City and letting the bicycle carry your stuff for you, you can rediscover the simple joy of riding a bike simply to move from point A to point B. No adrenaline, no rush, and no sweat. It is a fantastic way to experience your city in a whole new way, and all it takes is a little push.